Preserving the tradition since 1910. Celebrating 100 years. www.olsenfish.com. 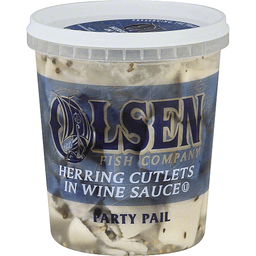 Wild herring from Canada. Packed in the USA. All natural. No preservatives. Excellent source omega-3. Since 1908. Sealed for freshness. 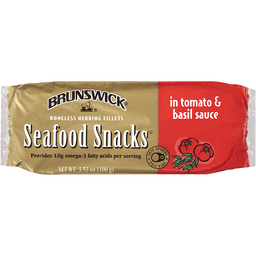 Contains 590 mg of omega-3 fatty acids per serving. Supportive but not conclusive research shows that consumption of EPA and DHA omega-3 fatty acids may reduce the risk of coronary heart disease, lower blood pressure and help reduce arthritis inflammation. 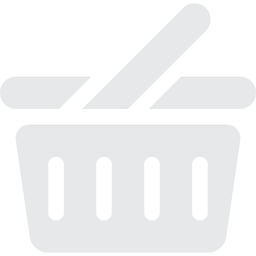 www.vitafoodproducts.com. Packed in USA. Wild caught of Canada. Made with natural ingredients. Preservative free. 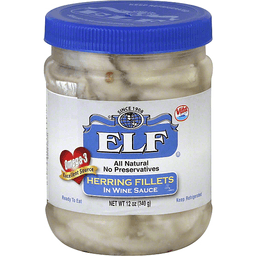 Omega-3 fatty acids (Contains: 713 mg of omega-3 fatty acids per serving). Since 1908. Sealed for freshness. Supportive but not conclusive research shows that consumption of EPA and DHA omega-3 fatty acids may reduce the risk of coronary heart disease. 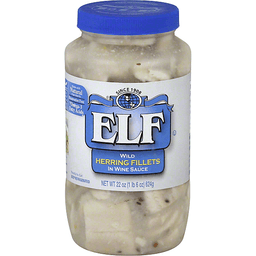 One serving of Elf Herring in Wine Sauce provides 713 mg of EPA and DHA omega-3 fatty acids. No high fructose corn syrup. Gluten free. Wild caught. Follow us on Facebook and Twitter. Wild caught of Canada. Packed in USA.